Many times during your social media campaign you may have a post that while it seems like it may ready, it is still in need of some tweaking. Luckily for you, the Social Media Poster lets you save these future posts as drafts in the Drafts tab. 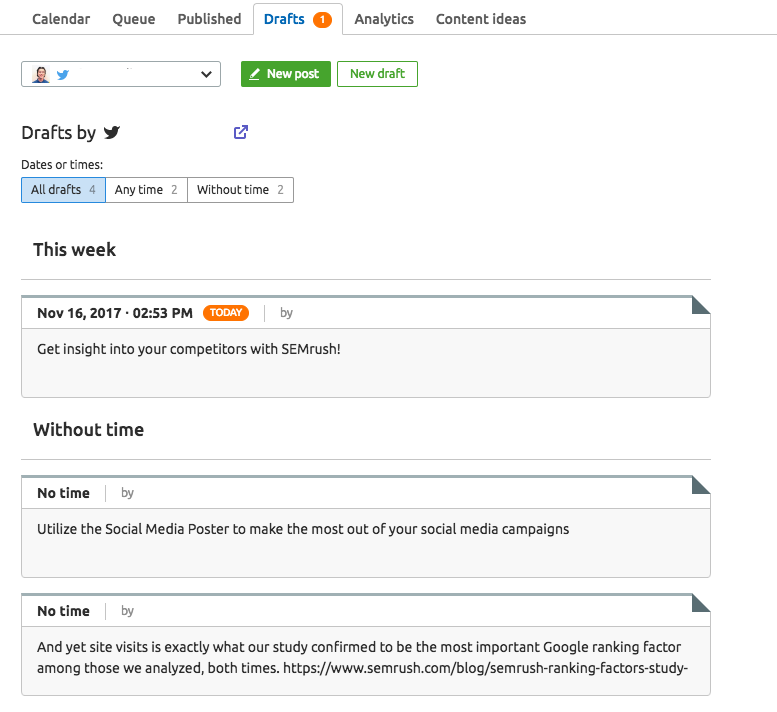 In this section, you will see all of your drafts and edit them in a number of ways to prepare them for posting. When creating a new draft you will be able to set up a notification time to remind you that your post is still a draft. You can set this notification at any time to align it with any other related posts you’re planning. 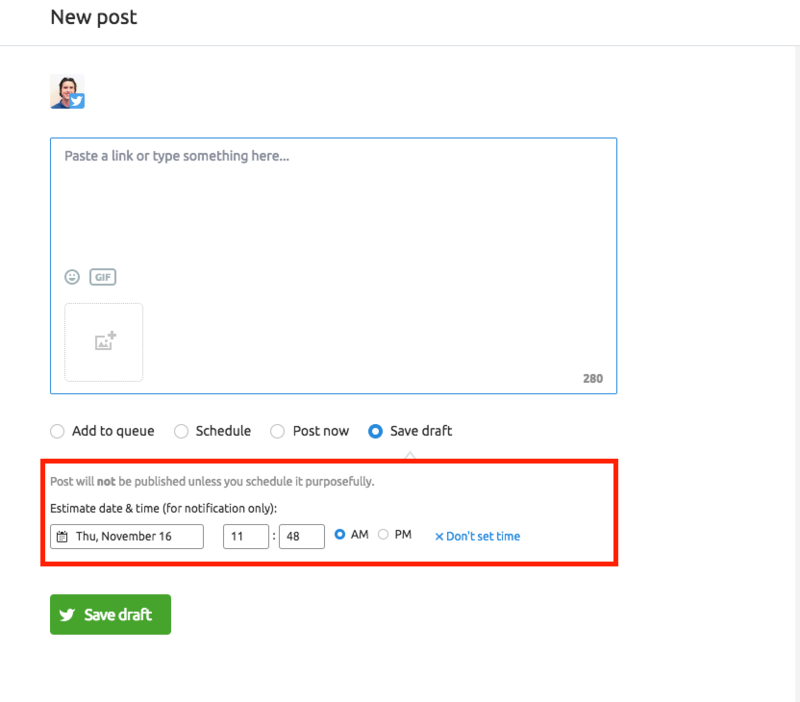 This can help you save time when creating specific campaigns as it allows you to create several posts at once and only posts the ones that end up being essential. Once the draft is added to your queue, you'll see it in your calendar and can make any further edits or changes from there. *Please note, that Twitter and LinkedIn limit the size of the static image that can be uploaded to 5 and 2 Mb accordingly. Besides that, Twitter doesn’t support GIF files bigger than 15 Mb. That is why the size of the image that is added to a draft shouldn’t exceed 20 Mb. For easier editing, Social Media Poster will resize your image in accordance with the requirements of the social network you choose automatically. If you are creating a new post that has a link to it, you can automatically shorten that link through integration with bit.ly. This can help tidy up the way your posts look and avoid having unsightly, overlong links. When creating a new post that contains a link Social Media Poster will instantly shorten up the link when entering it in the post creation window. At any time you can manually decide whether or not you want Social Media poster to shorten any links in the future. This can be done in your settings, under your profiles and queue tab. In the drafts tab, you can sort your drafted posts by those that have a date and time notification set and those that do not. Whenever you draft up a new post they will automatically be sorted into two separate tabs depending on the aforementioned stipulations. You can choose to view all of your drafts at once, just the drafts that have times set, or the drafts without times.